Puri, Puri, a common breakfast meal in India, flakey and delicate it crunches the mouth and moistens when dipped in Sabziya (veggi), then soothes when followed by a sweet sip of chai. These days I avoid oil driven transportation in favor of a bicycle, but in the dawning, I rode this to school, a RICKSSSHAWALA. In the evenings I burn Dhoop, a common scent hindus use. It feels like play-dough. Pushkar, where the gulabi pink shines freely. As do Videshis. Pushkar, near the lake lies a castle. Abandoned as I ache to go in and relive it's past. Pushkar, where the lake is holy and well repected. The Jhalana Hills offer a great view of Jaipur. BakADRI! And a cute up right tail. Mehendi, which smells of Worstechier Sauce, of all things. He catches them from the wild, and said he never keeps them for more than 15-20 days. This one was two days tame. Photo by Kat B. According to my botany specialist, here we have a Crinum lily in front of my school, gracefully exposing it's pollen. And here we have me, gracefully exposing my favorite dish of the town. Pizza away from pizza, Home away from home. 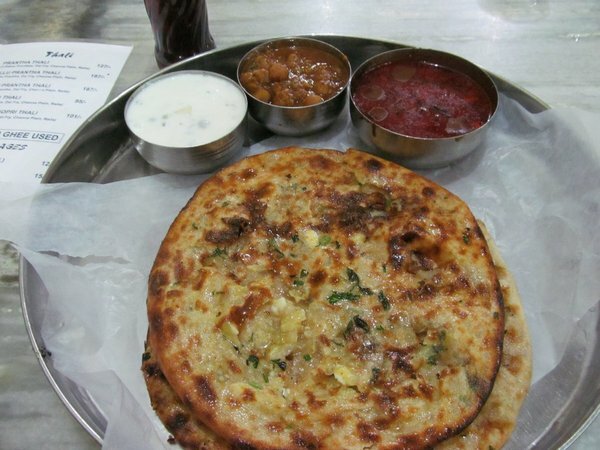 Kulcha, this is Kulcha. A specialty in my hood here in Jaipur. And a loveable comfy snack.